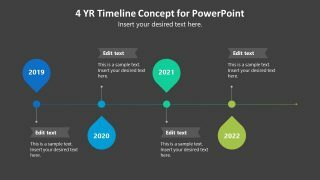 The Free 4 Years Timeline Template Concept for PowerPoint is a 4 steps linear process flow presentation. This free template has 2 slides of white and black backgrounds. These two backgrounds have dark and light text placeholders. And, it will help presenters to modify background colors without making many changes. The simple free timeline with four-year milestones will assist users to describe various concepts including project plan, progress and more. Here, the horizontal timeline contains balloon-shape segments to highlight years. But users can alter the text and add titles or keywords instead. 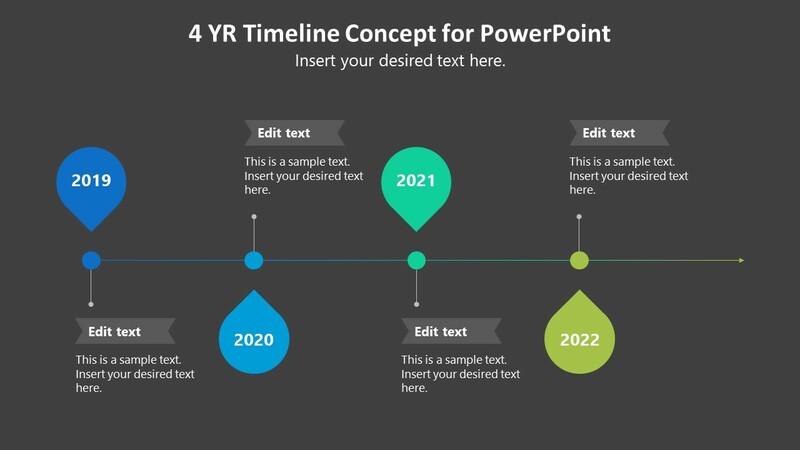 Further, adding infographic icons to explain a plan’s process can also enhance the visibility of timeline template. This 4 years timeline template provides label-style text placeholders layout. The primary color scheme of timeline is blue and green, which is customizable through shape fill option. 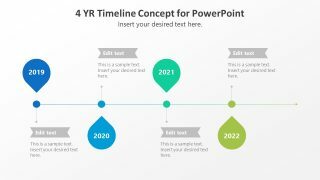 The Free 4 Years Timeline Template Concept for PowerPoint, as a part of business presentation, can attract audience’s attention. For example, highlighting companies major events of past four years. Or, providing the yearly revenue growth information to company’s stakeholders. These ready-to-use timeline designs can effectively deliver multiple concepts like plans, project forecast, goals, and events. Not only the organization’s professional environment but the timeline diagrams are also helpful in learning as well. It is a toolkit for teachers who find better ways to delivery history or just linear process flow diagrams.